Can someone please explain to me why Australia needs a squadron of FA-18F Super Hornet strike fighters? At a cost of $6.6 billion. 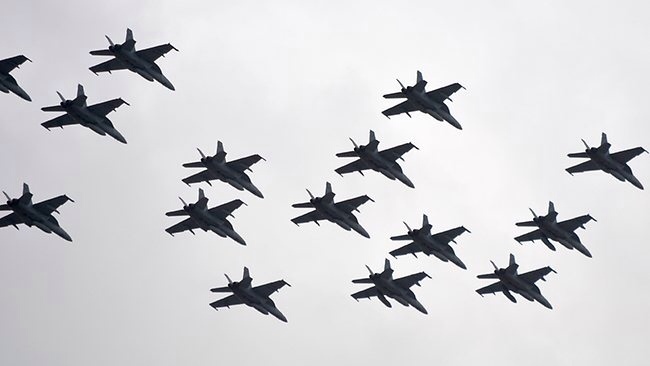 I’m not talking here about the bizarre way the Howard government leapt into the purchase of 24 Super Hornets back in 2006, or the equally disappointing way the subsequent Rudd government decided to go ahead with the arrangement. I’m not talking about the controversies that rage about the relative capabilities of F22s, F35s, Typhoons, etc. I’m asking more generally what purpose fighter aircraft of any type serve for Australia or our region. I mean, what are we planning to do with them? They have a very limited range of uses, none of which seem remotely likely to eventuate. Are they some kind of international ‘statement’? If so, they are an incredibly expensive and feeble one. I say ‘feeble’ in comparison to the other kinds of ‘statements’ nations can make to each other. Are they some kind of ‘defence’ or ‘deterrent’ against invasion? What substantial difference could 3 squadrons of fighter aircraft possibly make in the scheme of things if our vast, largely uninhabited continent was to be attacked? I suppose they might scare off the niVanuatuans or Papua New Guineans, who aren’t likely to be mounting much of an assault anytime soon. But realistically what is the point of trying to use them to defend Australia if invaded by a large and determined enemy? Wouldn’t they just get people killed for very little gain? It seems to me that a defence force is only effective if it seriously makes a potential attacker think twice. If it is not likely to overwhelm an invader, it will only get people killed delaying the inevitable. I can understand the point of overwhelming national military defence (although I don’t advocate it because I don’t think it is realistically sustainable over the long term), but I see no point in underwhelming national military defence. Are they to make the average punter feel safer? Well, they don’t seem to be working. I am not aware of any public fears about imminent invasion by military powers large or small. The only fears that seem to surface, and they surface regularly, relate to a few thousand wretched souls seeking asylum in leaky fishing boats. Strike fighters are no help in this regard. I am proud of the many effective contributions made by the Australian military in various peace-keeping operations throughout the world. It seems to me there is a place for a professional National Guard/Coast Guard/Federal Policing force in 21st century Australia. Imagine how many men and women could be trained and employed, and how much equipment could be procured if Australia dropped outdated and unnecessary notions of owning strike fighters and submarines and armour, And instead aimed to make a professional, intelligent and respectful contribution to the region with aircraft, ships and equipment more suited to peace keeping, policing and humanitarian aid. But then, what would I know. ~ by Garry on October 22, 2011.